The Dalmore distillery has launched a new expression, The Dalmore Valour, for sale exclusively in travel retail. The spirit is named after the Clan Mackenzie’s act of bravery in 1263 when an ancestor of the Mackenzie Clan bravely saved King Alexander III from a charging stag. The grateful King granted the Mackenzies with a Royal 12-pointer stag in their coat of arms. The Dalmore distillery was long owned by The Mackenzie family and every bottle of The Dalmore single malt whisky is adorned with this proud emblem, symbolizing the distillery’s royal pedigree. A unique blend of three different cask finishes, The Dalmore Valour is matured initially in first fill ex-Bourbon casks from Boston and Claremont, USA and 30 year old Matusalem Oloroso sherry butts from Gonzales Byass, Jerez de la Frontera in Spain. The spirit is then finessed in Port Pipes from Duoro Region, Portugal to create a truly unique Dalmore expression. Launching with a high profile promotional display in Qatar Duty Free in March 2013, The Dalmore Valour and will be rolled out through travel retail outlets over the course of 2013, priced at £50, €55 or US$72. The Dalmore master distiller, Richard Paterson, said: “With a distinctive aroma consisting of scents of ripe plums, creamy caramel and citrus fruits on the nose and a wonderful palate that consists of oranges, pineapple and chocolate fudge, Valour is truly an exceptional malt. 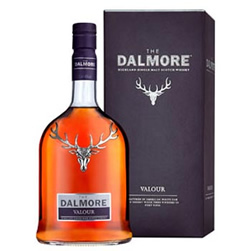 Dalmore – Valour, Highland Single Malt Scotch Whisky, 40% Alc/vol 70 cl. Nose…Thornton’s Special Toffee, oranges and lemon zest, ripe soft fruit. Taste…Pineapple chunks, Cadbury’s finger of fudge, sweet orange peel, milk chocolate. Finish…Medium to long, soft berries, almonds. Nose…Treacle sponge, millionaires shortcake, light tar, waxed jacket, oranges. Taste…Nutty crunch, daim bar, mini eggs, dark syrupy sponge, fruit loaf, orange oil. Finish…Medium to long with lots of chocolate. 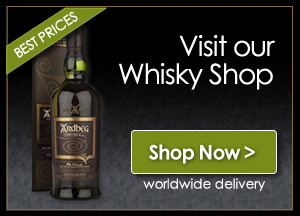 Very nice dram, pity it is only available at duty free, so the Whisky Boys will have to do a wee bit of travelling and a bottle or two of Valour will be on our shopping list. We suggest that you all take a look at Dalmore’s website www.thedalmore.com to find out all about their extensive range an all you need to know about the history of The Dalmore.